"If we can’t afford the water treatment, we just use it as it is. The South Sudanese Pound is not what it used to be. We’re already really struggling to make ends meet." 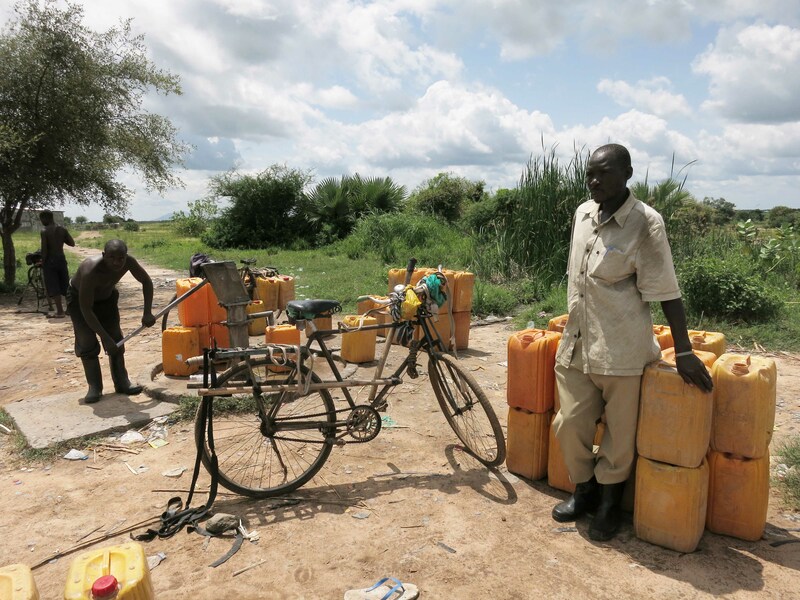 In South Sudan, only 55% of the people have access to safe drinking water. And due to increased costs of production, water providers in Juba are producing less and charging more, squeezing people’s access to safe water even further. People living in urban areas, particularly in poorer neighborhoods, have been hardest hit. They can no longer afford to buy enough safe water. Those who still can afford it, now spend twice as much as they did just a few months ago. 610,000 people living in South Sudan’s urban areas are now struggling with the cost of living that has increased by nearly 30% in the first half of 2015. Putting food on the table becomes the priority. Buying safe water, often and quite understandably takes second place. Moses, Emmanuel and Sura are but a few of those drastically affected by the crisis. Moses has been in South Sudan for over a year. He is a mason by profession but construction work has been hard to come by since the economy took a downturn. He chose to sell water because demand for it is always high, guaranteeing steady income. “Water from the river is free. People who cannot afford to buy treated water from me have no choice but to use what they collect from the Nile. When I’m delivering water, I try and speak to my customers, find out how they are. Since cholera broke out, I’ve been talking to them about the importance of using clean water, and making sure jerry cans are washed with soap. Some customers also check if my jerry-cans are clean and asking me questions about the source of my water. I’ve also talked to others who I know want to use treated water, but can’t because they don’t have the money to spend on it. Some refuse to use treated water because to them it’s too salty and does not taste like water. A few months ago, before the value of the South Sudanese Pound went down, I used to give out free water sometimes. I wish I could still do that, but it’s impossible now because every pound counts. This business has really been affected by the economy. We were making the same amount of money but it does not have the same value as it did before. The cost of food, water and rent has increased. We were forced to increase the price of the water we sell because it cost more to collect it at the treatment site. I lost some customers, but some stayed. Married couple Emmanuel and Rhoda moved to Gudele, a town on the outskirts of capital city Juba, two years ago, with their 5-year-old daughter. The economy has affected their family, like many in South Sudan. “We buy water from the blue water trucks every three days if the trucks come to Gudele. They used to come regularly, but not so much anymore. When we ask them what’s wrong, they say that we live too far and fuel is expensive or not even available sometimes. Recently it’s been a challenge to get clean water for our day-to-day activities. If the trucks don’t come, our next option is to fetch untreated water at a water point about 700 metres away from our house. Many people fetch water from there and the lines are always very long. Sometimes you can wait in line for hours and in the end walk away without water because it’s finished. If we get water, we treat it and use it for cooking and drinking. If we can’t afford the water treatment, we just use it as it is. The South Sudanese Pound is not what it used to be. We’re already really struggling to make ends meet. Sura outside her home in Gudele. Credit: Stella Madete/Oxfam. Sura is a single mother of five. Since separating from her husband, she has been living in Gudele with her mother, both raising Sura’s growing children. “I get water from the blue water trucks. They used to drive through this neighborhood everyday, but now they hardly come. It’s on and off. I’m not sure what is going on. When the water in my house gets finished, I ask for some from my neighbors. When it rains, I collect that water in my buckets and drums. Ultimately, ending the war is the starting point to solving this crisis. Oxfam appeals to South Sudanese leaders to work towards building lasting peace and re-committing to providing essential services for their people. 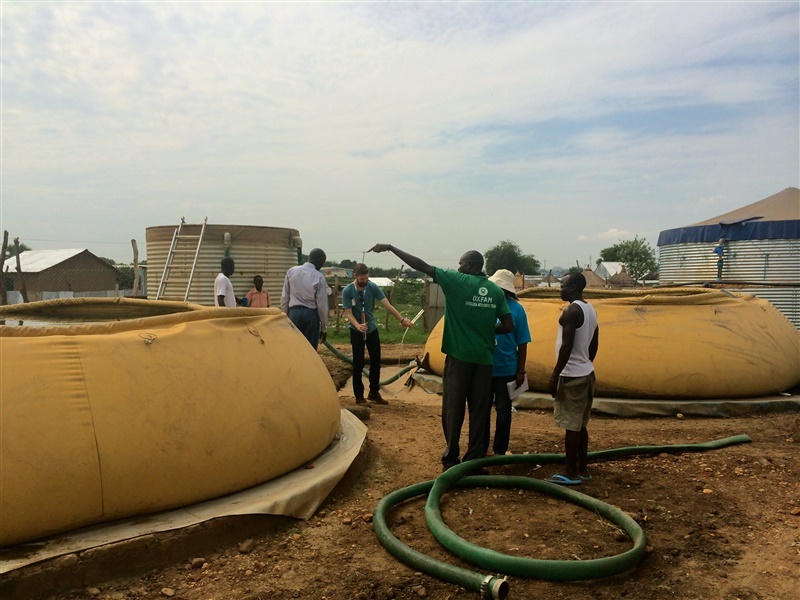 Throughout Juba, Oxfam is fixing boreholes, supporting effective chlorination of water delivered by water trucks and increasing water treatment infrastructure for bicycle vendors to increase supply of safe water. In one Protection of Civilian (PoC) site within a UN base in Juba where over 28,000 people live in crowded conditions, Oxfam is promoting good cleanliness practices, such as hand washing and the cleaning of water storage facilities. Oxfam is also installing hand washing facilities at strategic locations within the site and working with restaurant owners to raise awareness about the importance of using clean treated water for cooking and selling food. However, concerted action from the government of South Sudan as well as increased funding from international donors is needed to ensure people get enough clean water. In Matangai, Rumbek, they relied heavily on rainfall and distant boreholes to irrigate their land. With most of the men gone, the women must both provide and care for their families alone, the long daily trips for water was leaving time for little else. This bold film captures the stories of 9 South Sudanese refugees.